Though Henry has traveled far and wide in his search for wildlife and wilderness landscapes no place is more near to his heart than his own backyard, Grand Teton National Park. A Jackson area resident since 1983 Henry has spent more time photographing beneath the majestic peaks of the Teton Range than in any other place. In this beautifully designed coffee table book Henry has teamed up with local landscape photographer Fred Pflughoft to bring you a truly complete view of this amazing national treasure. From spectacular peaks to incredible wildlife, Wild & Beautiful will take you through all the seasons and all the moods the Tetons have to offer. You will find rainbows at dawn, thunderstorms at dusk, frozen bison and munching moose; in fact many of the images that hang on the walls of Wild by Nature Gallery grace its pages. 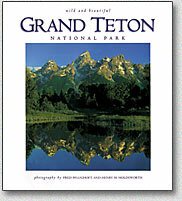 For anyone who enjoys the breath-taking scenery and sensational wildlife of the Grand Tetons this book will take you back to the mountains time and time again.